Ferrite Inductors - Agile Magnetics, Inc.
At Agile Magnetics, we specialize in designing reliable, custom inductors that meet the exact specifications of our customers’ applications. Since 1992, our highly experienced team has led the industry in manufacturing quality Ferrite Inductors for the most demanding industries and applications, providing customers with the precision magnetics needed. Ferrite Inductors, best used for high frequency applications, use ferrite cores that are comprised of ceramic magnetic materials, ferric oxide, and a combination of zinc, manganese, and nickel. After working closely with a customer to determine the best material for their particular application, our team manufactures the inductors in our 40,000 square foot, ISO 9001 compliant facility. This in-house design and manufacturing process provides maximum control, customization, and flexibility for our customers. During the custom inductor development process, our team assists customers in evaluating each factor that goes into the design and manufacture of their products, including assessment of rated current, required inductance, dielectric strength, and acceptable copper and core losses. Every Agile Magnetics Ferrite Inductor fulfills the highest standards of quality; in addition to being fully ISO 9001:2008 and AS9100 certified, our products can be built to UL, CUL, CDE, and CE standards. UL and CUL markings are also available when required. We pride ourselves on our ability to produce custom inductors in a timely, cost-efficient manner without compromising quality. 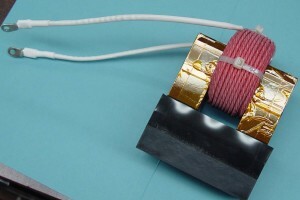 For more details about our custom Ferrite Inductors please contact us directly.